Be sure to save the date for Sunday April 8th, 2018 for the 15th Annual Future Stars Performing Arts Competition, South Florida’s premiere annual performance competition for middle and high school dancers and vocalists. 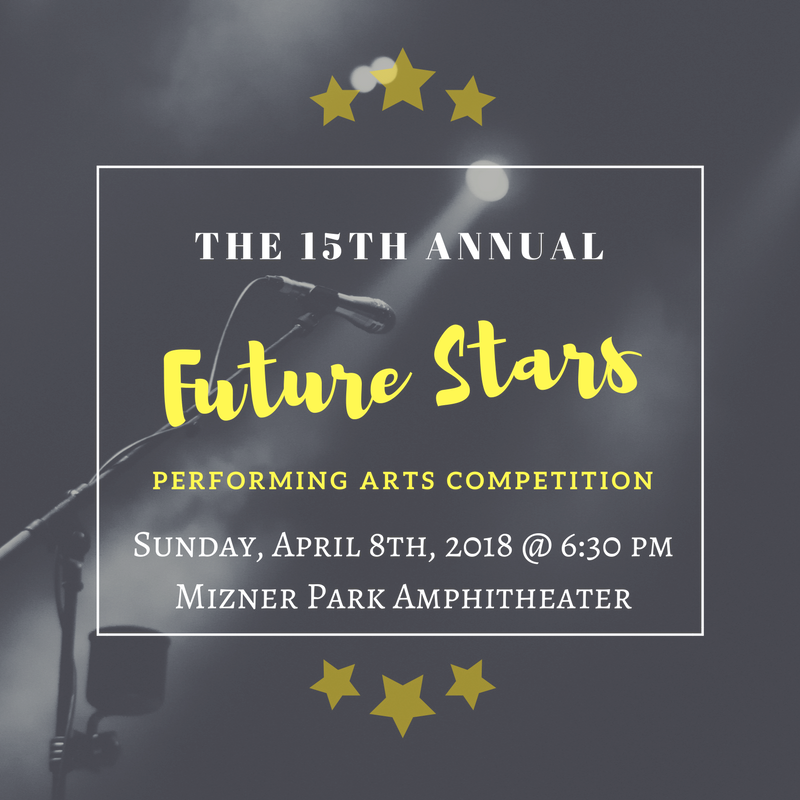 Presented by The Rotary Club of Boca Raton, this year’s Future Stars Performing Arts Competition will be held at renowned Mizner Park Amphitheater in Downtown Boca Raton. Recognized as one South Florida’s most prestigious performing arts competitions, the event will showcase performances by South Florida’s brightest and most promising young vocalists & dance artists as they compete before a panel of prominent professional judges. Performers will compete for the title of “South Florida’s Next Top Talent” in their respective artistic categories which include Top Dance Group, Top Middle School Dance Soloist, Top High School Dance Soloist, Top Middle School Solo Vocalist, and Top High School Solo Vocalist. All of the performers who will be competing were carefully selected through a rigorous and highly-selective preliminary audition process, previously held on February 3, 2018 at the Pine Crest School’s Performing Arts Center. The exclusive list of audition finalists who made the final cuts to compete in each category at this year’s Future Stars Competition can be found by visiting the Rotary Club of Boca Raton's Future Stars Event Page. This must-see event is free and open to the public with doors opening at 5:30 pm and the show beginning at 6:30 pm. There will be a limited amount of free pre-set seating available on a first come, first serve basis, however guests are welcome to bring their own chairs and blankets to set up on the lawn of the Amphitheater. There are also “Premium” seating & “Premium VIP” seating tickets, and a “VIP Premium Seating & Video Package” available for purchase for those who want to be sure to have some of the best seats in the house for this spectacular event. All proceeds from premium seating ticket purchases will go towards supporting the Rotary Club of Boca Raton and also help make it possible to continue to hold The Future Stars Performing Arts Competition for years to come. Click here to purchase your Premium & VIP seating tickets to this year's Future Stars Performing Arts Competition in advance. Remember to mark your calendars for Sunday, April 8th 2018, and come out to Mizner Park Amphitheater to help support the Rotary Club of Boca Raton and witness the talent of South Florida’s most promising young vocal and dance performing artists. We hope to see your there!